Last year, George Boehlert and Andrew Gill produced “Environmental and Ecological Effects of Ocean Renewable Energy Development,” a seminal survey that has helped to direct further study on the specific environmental impacts of implementing wind, current, tidal, and other ocean energies in the ocean open. Among the types of stressors, Boehlert & Gill mention physical presence, the effect on the environment caused by the presence of a structure at all in the ocean, and dynamic effects: That is, effects on the environment caused by working or moving parts of energy technologies, such as spinning turbines or coldwater intake. This section of Energy and the Environment aims to expand on the effects of this physical and dynamic pressence. 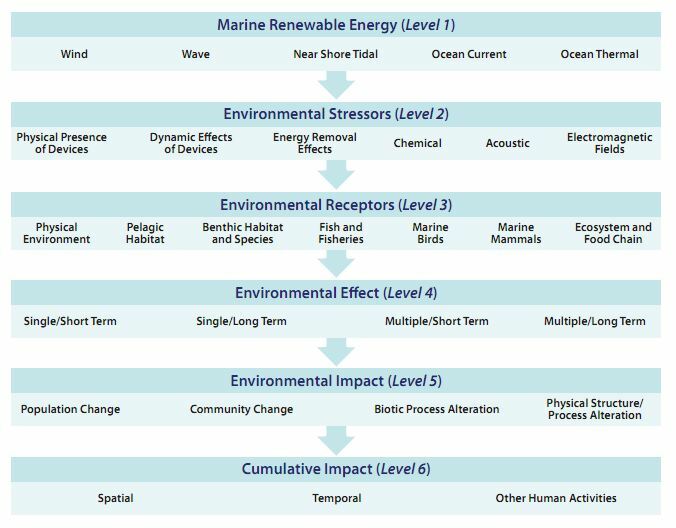 We’ve broken it up into 3 sections: Ocean technology’s effect on the physical environment itself, the presence of energy structures as new and different types of habitat for ocean organisms, and the problem of collision and obstruction of energy structures and ocean life, both above and underwater. The links below offer information on these three sections, as well as the works cited herein.